The CW has released the official still images for next week’s episode of The Flash, titled “I Know Who You Are”. You can see one of Killer Frost here, and the rest are available at Flash TV News. Plus, they’ve now released the synopsis for the second-last episode of the season, which will air on May 16th. It’s got the delightful title of “Infantino Street”, which is a nice tribute to Barry Allen’s co-creator Carmine Infantino. 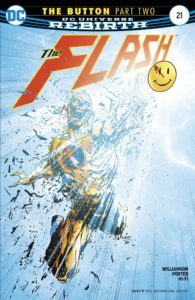 With only 24 hours left until Savitar murders Iris (Candice Patton), Barry (Grant Gustin) struggles to save the woman he loves and makes the choice to use any means necessary to do so. Realizing he has one option left to save her, The Flash turns to Captain Cold (Wentworth Miller) for help. Grainne Godfree did teleplay for the story by Andrew Kreisberg. The episode is directed by Michael Allowitz. The Flash Season 3 Episode 22 airs on May 16 at 8|7c on The CW. So Captain Cold returns to the Flashverse in some fashion, and it’ll be interesting to see how. For those who never watched Legends of Tomorrow, Cold died with the team, but was plucked out of the timestream and later returned to the same point before even joining the Legends. It’s not clear yet what his status will be in this episode. Looking forward to the return of Captain Cold? Eager for the imminent season finale? Share your thoughts! This entry was posted in Media on April 27, 2017 by Lia. Anyone who loves Easter Eggs should take a magnifying glass to any physical copy of this issue…and if you have it on digital get ready to zoom in on a regular basis. We are moving to more and more revelations about the DCU in REBIRTH, and the hints they are dropping are simply delicious! I want to tell you a LOT more…but to be safe, how about following us after the jump? This entry was posted in Reviews and tagged Batman, REBIRTH, Review, The Button, The Flash on April 27, 2017 by Ed Garrett. The Flash is going to the future to figure out Savitar’s identity, believing that to be the key to saving Iris. What he finds instead is what this episode is all about…and the title actually means something here. We get a very interesting view of what we hope will turn out to be an alternate timeline, in a story reminiscent of a certain favorite movie of mine…but more of that in just a moment. Want to know more? Follow us after the jump! This entry was posted in Reviews and tagged CW, Review, Savitar, The Flash on April 27, 2017 by Ed Garrett. Here’s the extended trailer for next week’s episode of The Flash, titled “I Know Who You Are”. The episode will air May 2nd, 2017. Plus, as you can see above, the CW has released a new poster for the last few episodes of the season. There are only four episodes left now, so the final showdown with Savitar is obviously imminent. Looking forward to next week’s episode? Interested to see the debut of Tracy Brand and learn what she’ll bring to Team Flash, or watch the clash with Killer Frost? Share your thoughts! This entry was posted in Media and tagged Flash TV Show 2014 on April 25, 2017 by Lia. The four-part crossover “The Button” continues this week in Flash #21, and you can see the preview up at The Beat. There are a whole lot of easter eggs to be seen here, and it features the return of a long-missed standby from the Flashverse. Check out the preview at the link, and let us know what you think about it. What do you hope to see in the remaining three issues of the story arc? 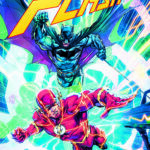 This entry was posted in Flash News and tagged Batman, crossover on April 24, 2017 by Lia. The CW has released the offical synopsis for the May 9th episode of The Flash, titled “Cause and Effect”. This will be the third-to-last episode of the season. 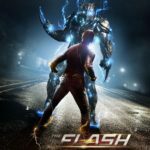 DRASTIC TIMES CALL FOR DRASTIC MEASURES – Barry (Grant Gustin) takes drastic measures to stop Savitar. Meanwhile, H.R. (Tom Cavanagh) continues to push Tracy Brand (guest star Anne Dudek) to design the trap for Savitar and Killer Frost (Danielle Panabaker) returns with an interesting proposal. David McWhirter directed the episode written by Judalina Neira & Lauren Certo (Flash#321). Original airdate 5/9/2017. So Killer Frost will definitely be sticking around for a while. Interesting. Any thoughts on the identity of Savitar? What do you hope to see happen by the end of the season? Share your thoughts! This entry was posted in Media and tagged Flash TV Show 2014 on April 20, 2017 by Lia.